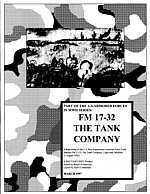 FM 17-32 The Tank Company (August 1942) is the second book in our U.S.Armored Forces in World War Two series, illustrating U.S.Army Company level tank tactics. Containing numerous pictures and clear instructions, it is an example of manual writing at it’s best and gives a concise understanding of basic World War Two tank tactics. It is almost to simple showing picture by picture the do’s and dont’s of leading a U.S.Army World War Two Tank company. Clearly written for officers who have had no previous experience in armored warfare.